Along the middle Rhine River, great views from our Viking Rhine River cruise ship. In May, 2017 we sailed a Rhine River cruise from Basel, Switzerland, north to Amsterdam with Viking River Cruises. Amazingly, this is our fifth river cruise, fourth with Viking, and we’re surprised, even ourselves, at how much we enjoy these experiences. What we appreciate in a river cruise is the combination of onboard relaxation and interesting shore excursions. Viewing the world from the unique perspective of the river is always alluring. (It reminds me of canoeing the Mississippi when I was young, marveling at how familiar places became suddenly exotic seen from the water surface.) But it’s this blend of easy-going life on the ship with charge-ahead discoveries on shore that makes this type of travel appealing. Vikings Cruise’s Rhine Getaway cruise was a good example of shore excursions done right. Granted, the Viking Cruise Rhine itinerary’s pace allows for little more than a survey course in local culture and history. But we appreciate the introductions and tend to return to places we like at another time. The Viking Rhine River cruise touches on four countries: Switzerland, France, Germany, and the Netherlands. 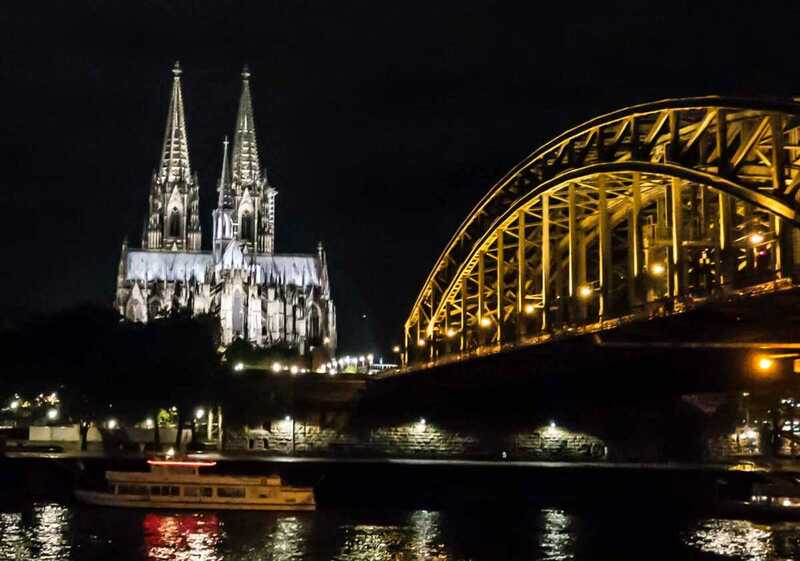 Maybe for this reason, the Rhine River Cruise Getaway offers more shore tour selections than other cruises we’ve taken. Most shore excursions are included, some are available for an extra fee. In this case, we even needed to make some tough decisions between conflicting opportunities. Here are tours we took and want to recommend to you. What’s not to like about a sunny spring day along the Rhine River? 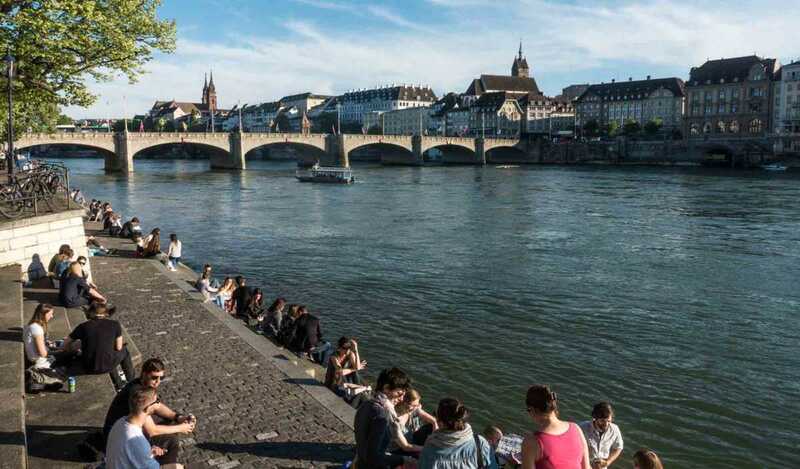 The people of Basel came out to bask. We don’t generally book the extension tours, but we do love to arrive a few days early and explore on our own. Tip: if at all possible, arrive early and be rested in the proper time zone before your cruise starts. This historic town of Breisach on the German side of the Rhine was one of the little surprises we’d never have discovered outside this cruise approach. Check out Tom photo essay of our morning in Breisach. While we enjoyed our stroll, most others went on an included tour to the Black Forest by bus. Commemorating the liberation of the Alsace region on a site overlooking the Rhine valley. Also from our dock in Breisach, an afternoon excursion to the town of Colmar (France) was included. We chose instead this optional tour because we’d visited the town of Colmar before, and because we knew Tom’s Dad had fought and been wounded in the long battle at Colmar. Our guide, Malcolm, was exceptional, both knowledgeable and passionate. It was especially impressive to see the vast landscape of the valley, and understand that soldiers were totally exposed in the open winter landscape. The villages, just a couple kilometers apart, are still marked by church spires that served as the lookout and sniper perches. We visited the site of Audie Murphy’s one-man stand and spotted children playing in a park nearby as our guide described the details of that heroic event. It wasn’t lost on anyone that we were being treated to this history on Victory in Europe (VE) Day, May 8. An interesting side note to our Colmar excursion: US Army Lieutenant Audie Murphy won the Medal of Honor for his heroic one man stand against a German counter attack at Colmar. He went on to become a movie star, based on the popularity his medal garnered him after the war. Our guided walk into the center of Strasbourg provided historic insights about this Alsatian center. One of our favorite European cities, we didn’t mind retracing our steps to see this town center again. The cathedral is one of the world’s best and our guide here was very good, walking us through interesting streets while narrating the historic importance of the Alsatian city here on the border of France and Germany. For those who wanted more time on their own, shuttles ran between the ship and center city throughout the afternoon. 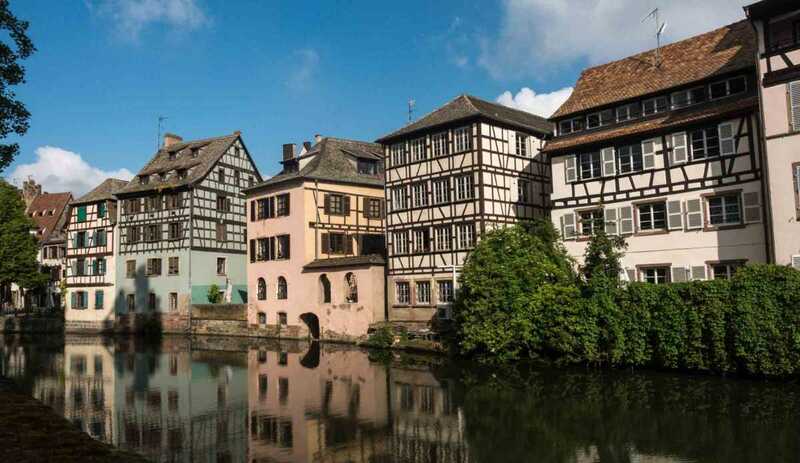 Of the two optional tours in Strasbourg, I chose the Alsatian Winery visit, and was educated and enticed by the tasting at Robert Blanck winery, details here. Good choice, Kris. Tom took his typical cathedral tour in Strasbourg, and I have to say that on this visit, and a previous one, he came away with some pretty good photos. 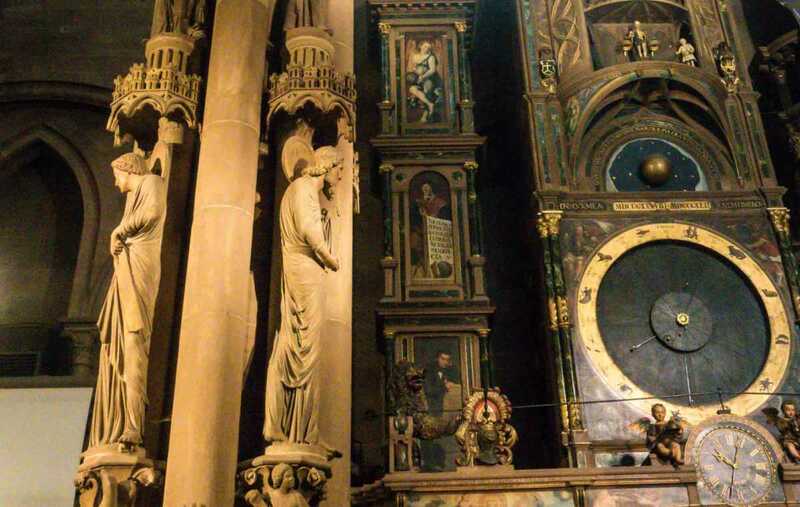 Detail of the Astronomical Clock in Strasbourg’s Notre Dame Cathedral. Guests reported they’d have liked more time on their own to walk the old town. It’s a gorgeous city, but we’d visited recently, so we took the day off and enjoyed the views from the river while catching up on work. Later, in Rüdesheim, we disembarked to stretch our legs. (Others had opted for wine tasting dinner choices on shore). Nothing in Rüdesheim tempted us, so we returned to our ship for dinner and were then treated to a glass-blowing display on board by a local artisan. Yes, I made a purchase, how convenient. Tip: Don’t feel you have to do it all. Skip out of shore excursions for at least half a day and enjoy the ship. Watch a movie, read a book, or sit on the deck and do nothing. 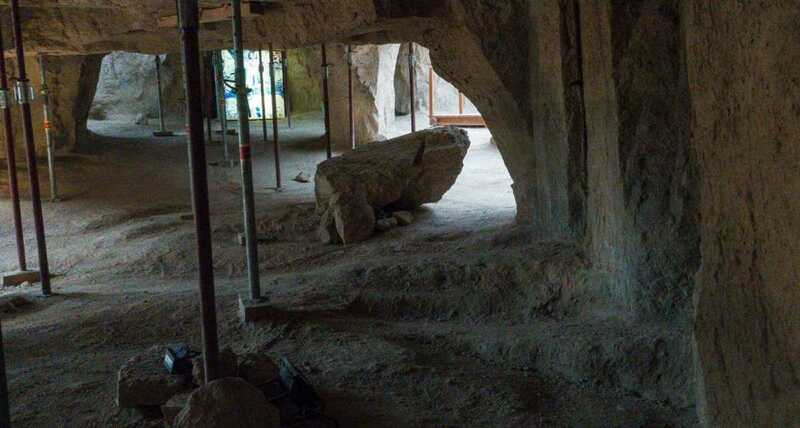 Near Cologne, this multi-level Roman mine produced much of the great architecture for Augustus. Looks like someone forgot to take this column with them. After checking out the various castles along the middle Rhine as we sailed, we opted for the Romans Mine at Meurin excursion. It’s a recent addition to Viking’s menu of options, so it may not be sufficiently annotated in your brochure. But it’s a really cool Roman mining site, partially excavated to show how and where Romans quarried building materials in the time of Augustus up through the Middle Ages. Hands-on exhibits demonstrate the mechanics devised for heavy lifting and everyday life: pulleys, cranes, construction and finishing tools, and mills. Recommended. Others opted to visit the Marksburg fortress or walk around Koblenz. Leaving Cologne at night. The bridge delivers trains right into the city center alongside the cathedral. We were excited to visit Cologne for the first time, and again our Viking shore excursion guide was top notch. While Tom stayed around the ship and river banks of Cologne in the afternoon, I visited the UNESCO World Heritage Brühl Palaces, an optional tour of the 18th Century Augustusburg Palace and Falkenlust hunting lodge. I learned a thing or two about falconry, and enjoyed the country air, if not the Bavarian Rococo style. Cologne has all the vibrance of a top university city, because it is. Based on our introductory tour, I hope to visit Cologne again next time I’m in Germany. There’s more Kolsch beer to sample and more museums to visit, always. The winds were up so the sails were down, but we got to go inside on our visit. By now our cruise was making its way through the canals, though it’s hard to discern where managed rivers end and canals begin. This included tour of windmills exceeded expectations, as we could go inside the mills and see how the family/operators lived. I’m sorry to have missed the optional Dutch Cheese Making tour. By all accounts it was a great tasting and a wonderful opportunity to chat with local producers. We finished by spending a few days on our own in Amsterdam. 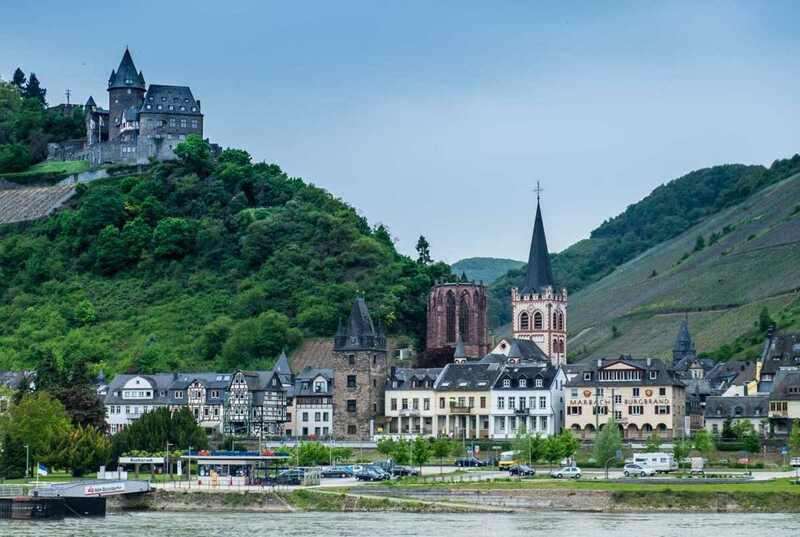 Like other good river cruises, this Rhine Getaway by Viking offers great experiences on shore and well as on board. A variety of scenery, cities big and small, special selections of food, wine and beer tastings, and a range of cultural experiences: that’s what we like–and why we keep coming back. We’ve been introduced to the Rhine and we’ll draw on on these shore excursions as we plan future travel. Note: We were hosted on this cruise by Viking River Cruises who did a fine job keeping us happy on board and ashore. Opinions expressed here are the authors’ alone, and have not been reviewed, approved nor edited by Viking or any of these venues. Also, we extended our trip, starting in Amsterdam, with train travel to Germany and back to France provided by our friends at Eurail. You can also get more Lowdown on Travel with Eurail here. And here’s more on our European river cruises with Viking on the Rhone River cruise and The Danube River Cruise. And, if you like, the Yangtze river cruise in China. And you can read about our Russian river cruise with Viking, too. You can also get a lot of travel inspiration from our new Get Started Traveling page. So nice to have met you on this trip! Great post about all the shore excursions, we actually did the opposite tours since it was our first time visiting many of the spots. Great to hear about what you experienced on yours / what we missed! I’m also kind of wishing we opted for more of the food ones in hindsight.. ha. Thanks, Sher, and I’m glad you sent along your post about the cruise. I’ve included your link in the post’s round-up. wow! These excursions seem awesome! Would you recommend going on the Dutch Cheese Making tour? Yes, from all accounts it was great–friendly, instructive, and tasty! See Chewing the Fat’s “Part 2” post for one response. I went on this VIking Rhine Cruise last year and really enjoyed it. My favorite excursion was the Food and City Tour of Strasbourg. Definitely one not to miss. We didn’t have any time to explore Basel. Maybe next trip. Cool! I think Strasbourg is really overlooked as a great food city, while Paris and Lyon battle over top honors. So glad you enjoyed your experience. HI Kristin. I would love to take a Viking River Cruise up the Rhine! It looks like you had a marvellous adventure! Yes, we did, and it was completely unique and distinct from other European river cruises. The Rhine valley is both beautiful and historic. I did a very brief (one day) Rhine cruise many years ago. I was astounded by the scenery and the numerous German castles. But doing a longer trip as you did must have been amazine – so much variety of places! I agree the scenery is great, particularly on the day of the middle Rhine section. But yes, we really enjoyed the city and countryside excursions. With my husband and I turning 50 this year and our only child heading to college, we’re looking for new places to travel. Adding a river cruise to our bucket list! That’s great, Kim. When we first had an empty nest, we felt like we were in our 20s again, traveling wherever we liked without asking permission! We are celebrating our 50th wedding anniversary this year and we hope to celebrate all year long. We’ve been dreaming of taking a Viking River Cruise for years and we decided to take the and make this year as part of our celebration with a river cruise in Europe. 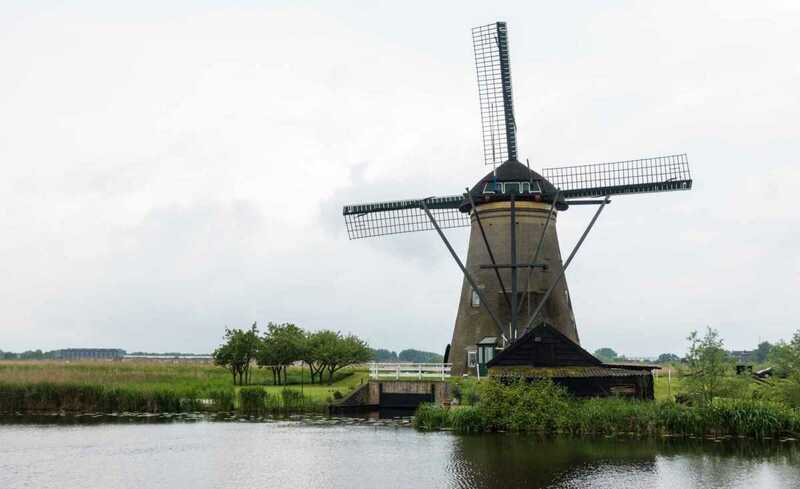 The Viking Rhine Getaway you wrote about in this post is the very cruise we have scheduled! We will depart from Basel in August and we are really excited. I do have a question that you might be able to answer. Are there conveniently located ATM’s in the various stops? I’m not sure if we would have enough time to use Basel Airport’s since Viking tells us that they would be meeting us at the airport to transfer to our ship. Have no worries. There are ATMs everywhere in Europe, especially where you’ll be going on this trip. Our best tip for you is to get credit and debit cards that do not charge foreign exchange fees. Check with your bank about that, or get a Schwab bank account with the associated debit card. That’s what we use. Also, one little tricky thing: Switzerland uses their own currency: the franc, while France and Germany will use the euro. The Basel airport, which actually straddles France and Switzerland, will have ATMs that dispense either euros or francs, depending on which way you turn. Literally. You’ll probably be able to get along with the Euro wherever, but if you’re going to be in Switzerland for a bit, you might be able to get along with a bare minimum of francs in cash. Everywhere you go will take credit cards. Have a great time! I’m a church guy, so I would highly recommend Cologne and Strasbourg cathedrals. The Roman camp was very interesting. And the Colmar battlefield tour was one of the most interesting tours we’ve ever done.